Bowditch Middle School has an enrollment of approximately 1100 students in 6-8th grades and prides itself in being a “diverse community of learners, languages and cultures.” The student body is currently 53% Asian, 29% White, 8% Hispanic, 8% two or more races, and 1% each Black and Hawaiian Native-Pacific Islander. To serve its diverse student body Bowditch offers a variety of options for various learning styles. Starting with the core subjects of English Language Arts, Math/Science and Social Studies, the school offers English/Reading Support, Math Support, and accelerated Math, plus a full palette of electives including Art, Astronomy, Choir, Computer Science, Creative Writing, Drama, Journalism, etc. Bowditch’s success in academics is shown in its Great Schools’ overall rating of 9/10, with a very impressive 10/10 in Academic Test Scores: proficiency in Math 78% vs state average 39%, and in English 81% vs 50% state average. In advanced STEM course Algebra 1, its participation is 51% vs state average 25%, and pass rate 97% vs state average 79%. 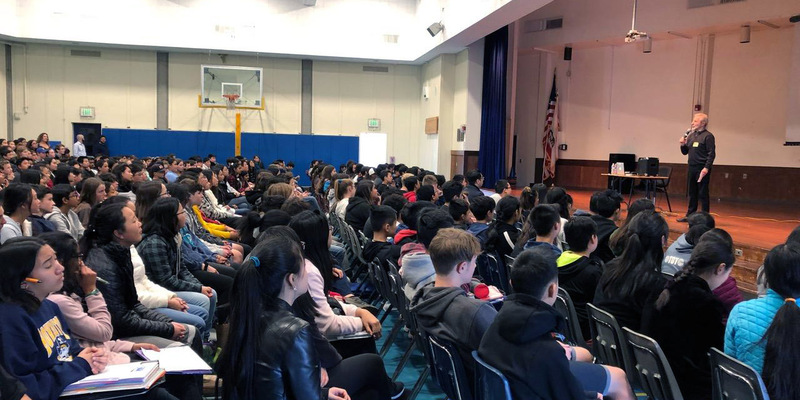 The audience at my talk was 330 mostly 8th graders enrolled in a unit of English Language Arts curriculum entitled Finding the Light in the Darkness/The Challenge to Make a Difference. Students started this unit by searching the Holocaust Memorial Museum’s website for topics to explore, reading passages from Night and The Boy in the Striped Pajamas, also scholastic articles on people who resisted Hitler, plus an independent book related to the theme of the unit. The broader themes on which they focused included ethics, perseverance, difficulty of noticing warning signs, all leading to selecting and doing their own multimedia project on subject of personal interest. The students’ preparation was especially impressive for 8th grade level, and it became evident in their excellent questions during the Q&A, and even more so after the Q&A with several small groups of students who remained to continue our discussions. 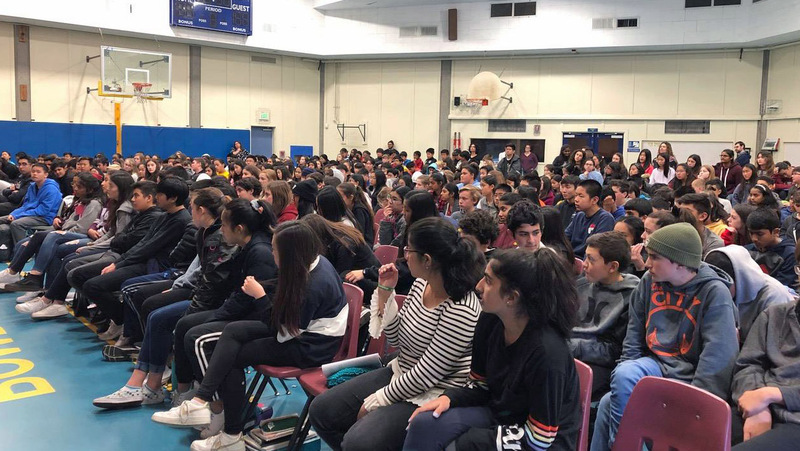 My talk was organized at Bowditch by Jasmine Amar, Language Arts & Social Studies teacher, with active participation of Heather Morgan, the school’s Principal. Attending also was Assistant Principal Caleb Bowers. 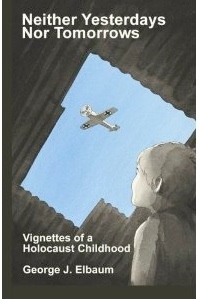 The talk was arranged by Penny Savryn, Program Coordinator at the Jewish Family and Children’s Services Holocaust Center. 10 days after speaking at Bowditch I received a large envelope containing 10 hand-drawn super-size (11” x 17”) THANK YOU cards, each with “Thank you” notes from 20-to-40 students, and 3 (normal size) Thank You cards with “Thank you” notes from 11 teachers. Photos of 2 of the super-size cards and of the other 11 super- and normal-size cards are shown below. I truly appreciate each of the 330+ personal “Thank you” notes, and the one which particularly stands out in my mind and echoes the study unit’s title, Finding the Light in the Darkness/The Challenge to Make a Difference, states simply “Thank you. The world needs your optimism” and shows a small candle lighting the darkness. with Scott and Kira: thanks much for the hot, fresh cookie! Bowditch Middle School: great view! Hi! I noticed you were uploading pictures of every presentation, so I was waiting for Bowditch to show up, and now it has. Thank you so much for coming to my school, I hope everyone enjoyed it as much as me and now has a better understanding of our history. My grandparents went through similar experiences as you, and it was so interesting listening to your story. Keren, thanks for your message. I remember our chat after my talk and your telling me about your grandparents. My very best to you.